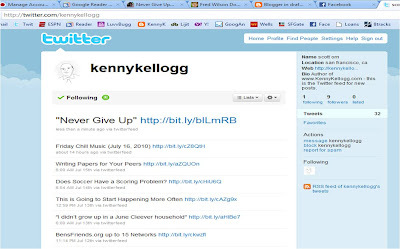 Hegarty suggested that I start a Twitter notification for everytime I post something on www.KennyKellogg.com so I obliged. The idea is to help people remember to check the blog in case they forget. No guilt if you forget. I'm here everyday posting away, but we'd love to have you. Most of my best material comes from ideas and comments from my friends. I hope you'll contribute!